This recipe was inspired, in a way, by a product that came on the market with little fanfare and was removed shortly after. I only came across a remnant in the store aisle and decided to try it before I knew it had been discontinued. 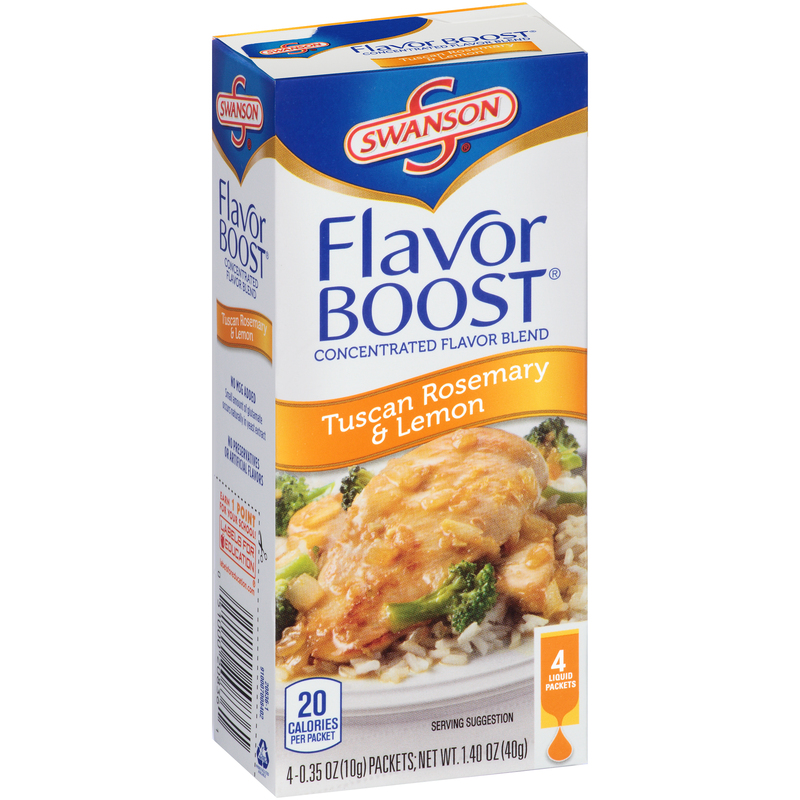 The product was Swanson Flavor Boost Tuscan Rosemary & Lemon. I made a batch of chicken with it and had many compliments. When I returned to the store much later, I couldn’t find any on the shelf. A little Internet research told the tale – No Longer Available. Well, there was some available; entrepreneurs has bought up the last stocks and were selling it on-line for ten times the old store price.I decided not to go that route. Taking a cue from the label and its list of ingredients and adding a few of my own favorite things I have managed to make a similar tasting recipe that I hope you will enjoy. 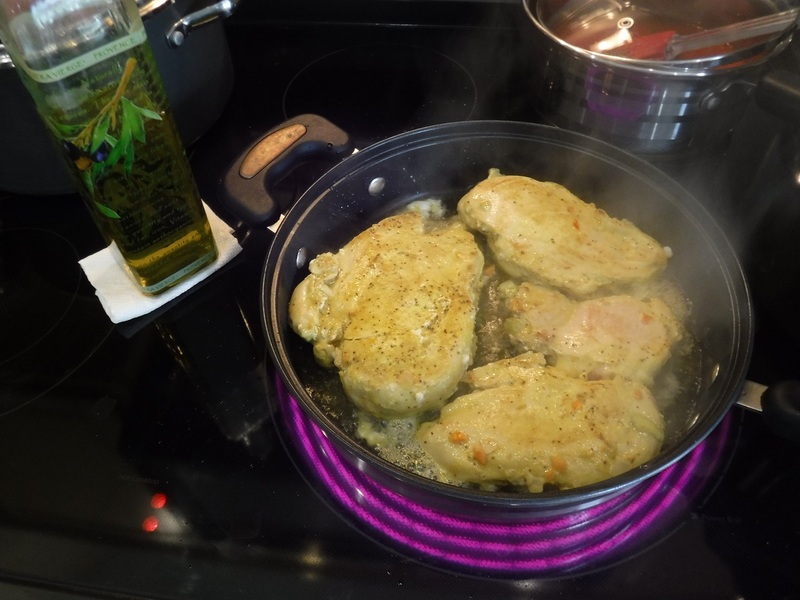 My favorite is boneless skinless chicken breasts (the large-sized breasts do need a bit of tenderizing) but I have made it with bone-in with skin breast, legs and thighs with excellent results. The choice is yours. 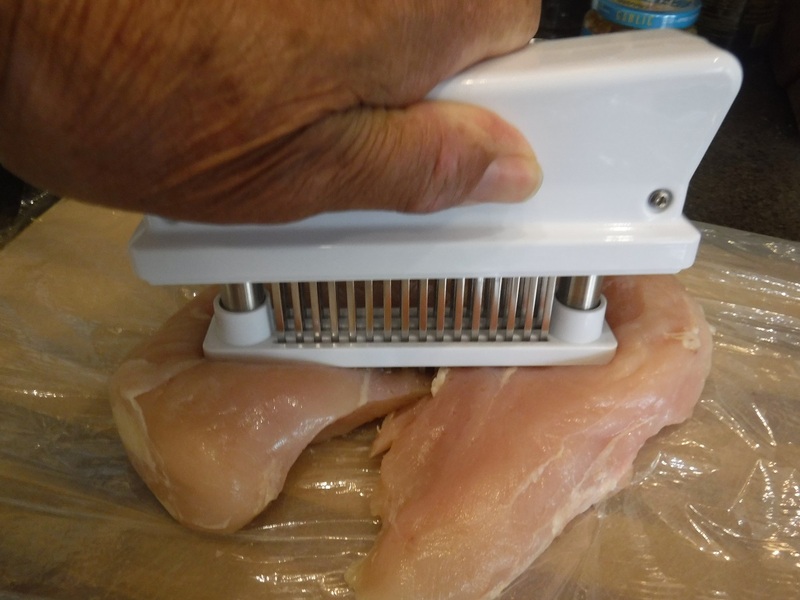 You can use your favorite chicken pieces (boneless, skinless, bone-in and with skin)– if using large boneless, skinless chicken breasts, lightly pound with tenderizing mallet to an even ½-inch thickness. Bruise the rosemary sprigs by rolling between plastic wrap sheets. The leaves will give up their flavor but not leave little wood stems in the food. Mix all of the marinade ingredients is a large, sealable plastic bag. 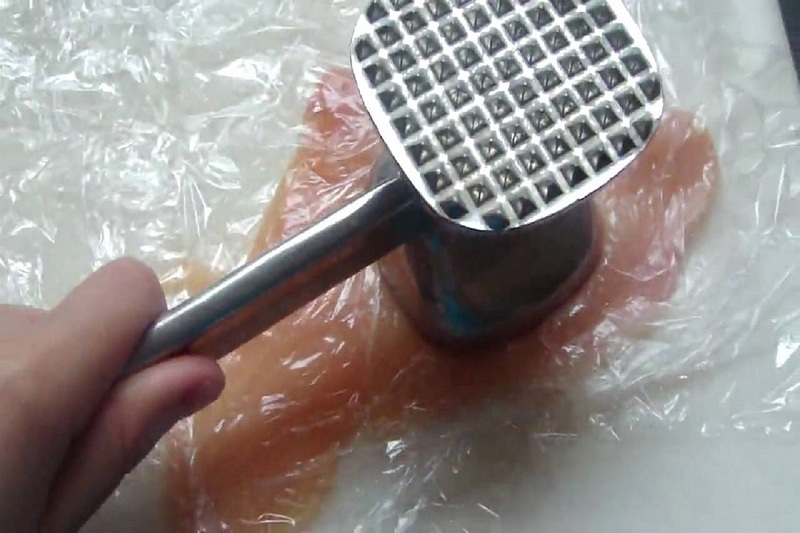 Add the chicken pieces and close the bag after carefully squeezing out all the air. Gently knead a few times to coat all of the chicken pieces. Marinate in the refrigerator, turning several times, for at least 4 hours but overnight is better. 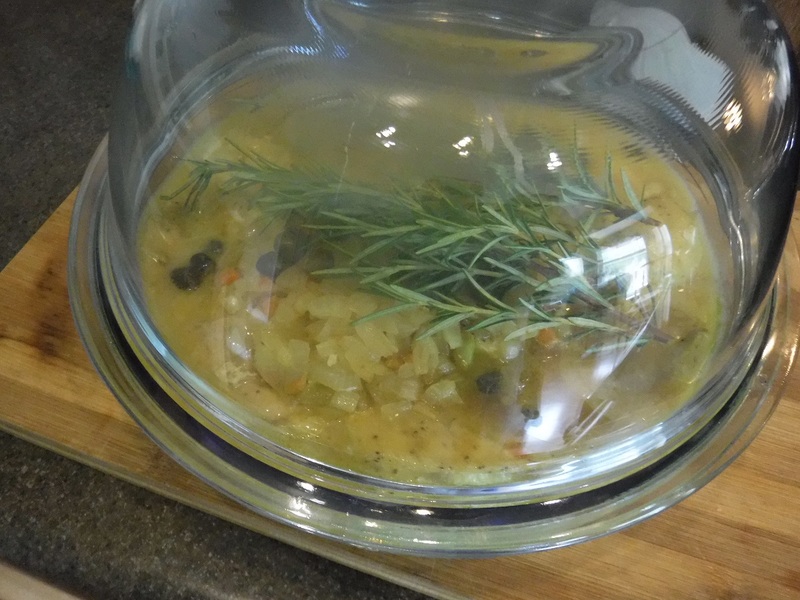 Add the cans of soup to an oven safe dish with a lid. Season with the turmeric and chicken base and set aside. Heat frying pan and add a bit of olive oil. Add the chicken and fry both sides of the chicken just enough to give a nice golden brown color. 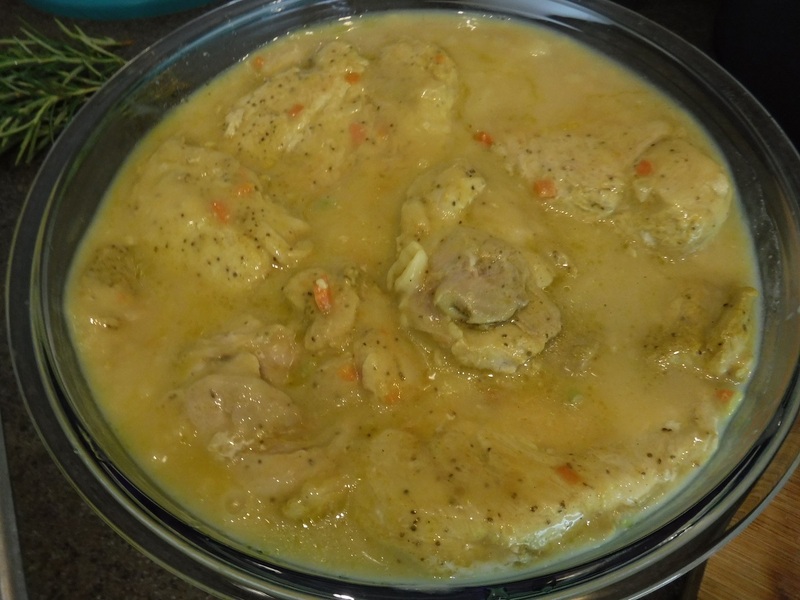 Place the browned chicken in the prepared soup dish. 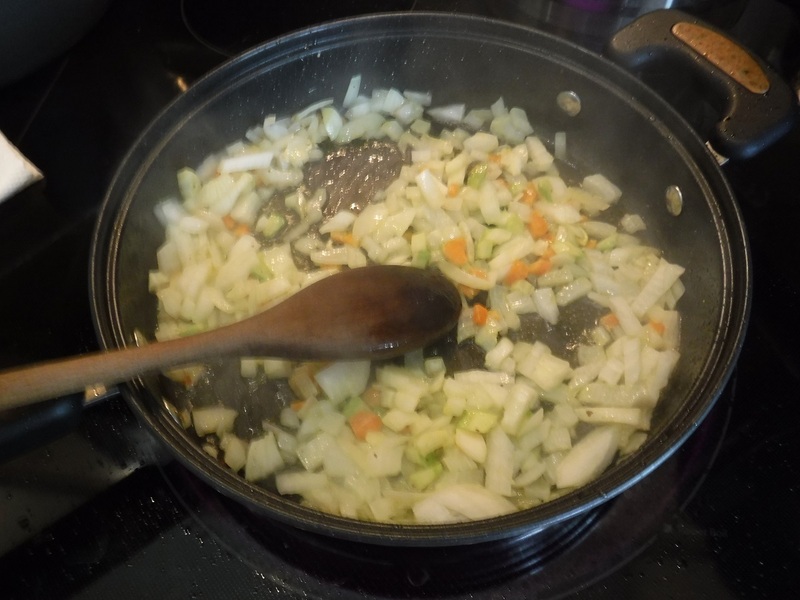 Add the onions and garlic to the pan and sweat the onions and garlic for a few minutes. 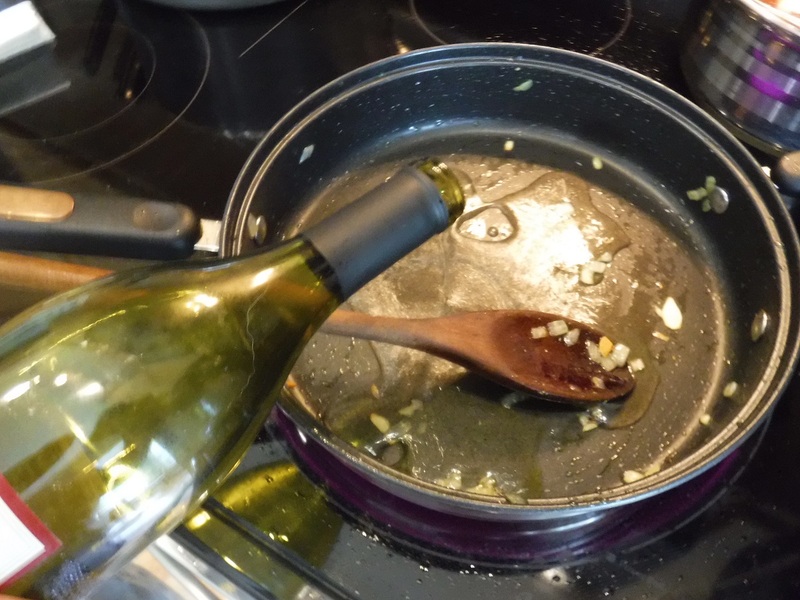 Deglaze the pan with the ¾ soup can of water (red or white wine works wonders too) and add to the soup and chicken. 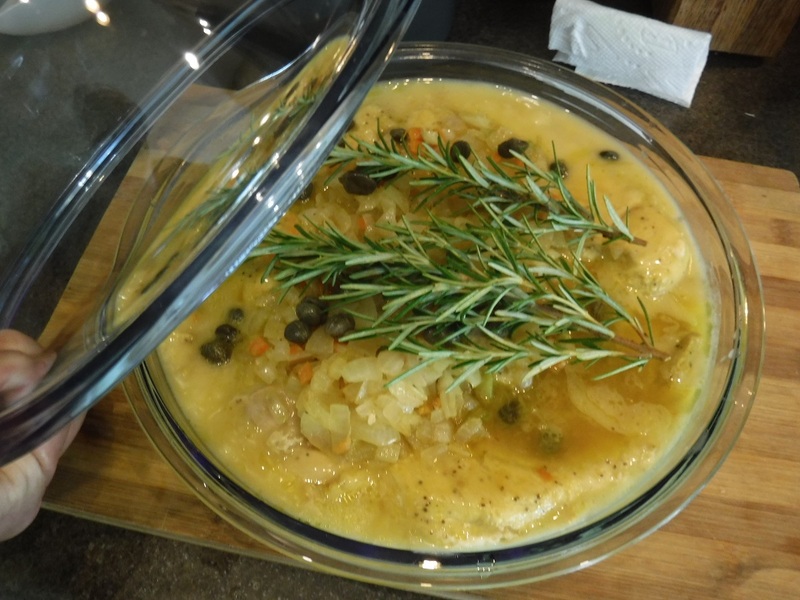 Turn the chicken once or twice to coat with the soup mixture and add the capers if using. Cover with the lid. 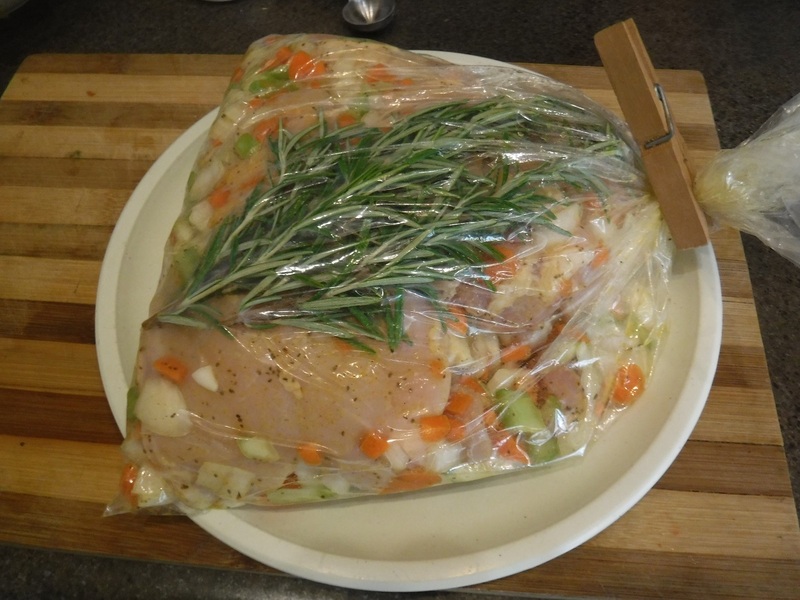 Place in a preheated 350°F oven for 45 minute to one hour (longer for bone-in chicken). 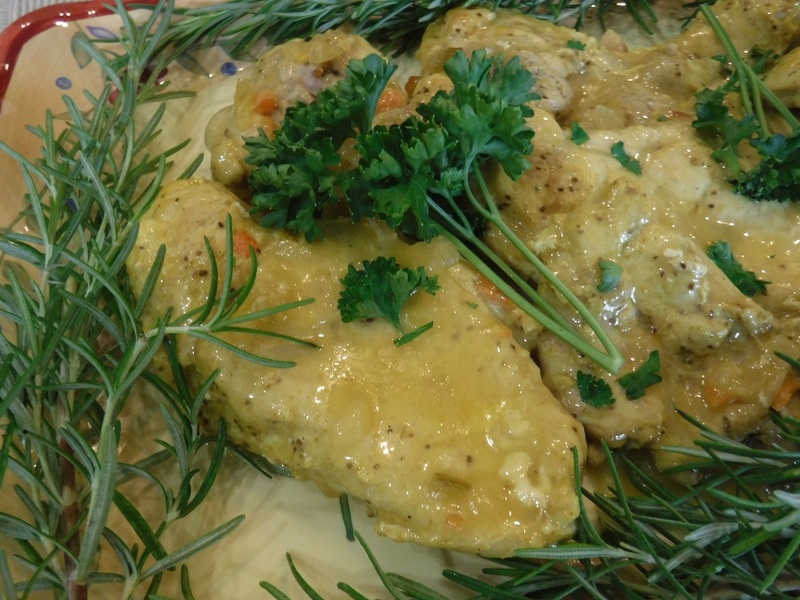 Half way through the oven cooking, turn the chicken to recoat with the braising liquid. 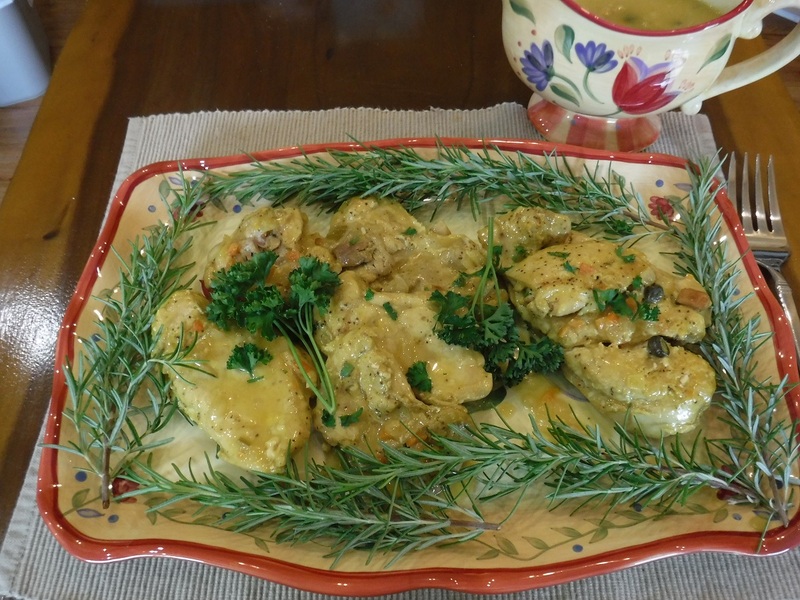 Remove the cooked chicken form the cooking dish and place on a plate and cover with foil for about 10 minutes before carving or serving; it will be fall-apart tender. Drizzle some of the cooking liquid on chicken and the remainder on the side as a delicious sauce/gravy.